It’s the most wonderful time of the year as Universal Studios HollywoodSM and Universal CityWalk® deck the halls for a wintry calendar of cool holiday activities at The Entertainment Capital of L.A.SM. A very, merry “GrinchmasTM” returns to Universal Studios Hollywood as the theme park celebrates the Who-lidays with The Grinch, his faithful dog Max and a roster of Whos from the town of Who-ville. “Grinchmas” runs weekends on Dec. 5-6 and 12-13, then continues daily from Dec. 18 through Jan. 3. The Universal Plaza, an elaborate grand piazza at the heart of the theme park, will serve as the backdrop for the lighting of the towering “Grinchmas” tree – a whimsical centerpiece twisting and spiraling 60 feet above visitors and providing the ideal setting for merry holiday making memories, while The Grinch, his adorable dog Max and the Who-ville Whos entertain guests nearby with fun-filled photo opportunities. As part of the fab-Who-lous event, Martha May Who-vier and the Who Dolls will take center stage by the “Grinchmas” tree performing energetic musical sets to usher in the Christmas season in style. The Wholiday Singers—a hip boy-band ensemble—will perform nightly a cappella concerts featuring a mix of Christmas favorites and pop rock. Who-bilicious Cookie Dec-Who-rating – Freshly baked, ginger bread and Christmas tree cookies will be available for purchase, and guests can create their very own amazing treats with an assortment of delectable frostings and tasty toppers. Story Time with Cindy-Lou Who – Cindy-Lou Who and her Who friends will gather guests of all ages – tall and small—for an engaging storytelling show of Dr. Seuss’s How the Grinch Stole Christmas, featuring special effects and audience participation. Universal Studios Hollywood’s newly introduced Annual Passes add additional cheer to the holidays as special stocking stuffer gifts. For more information or to purchase one of three new passes: the Gold Pass, the California Resident Plus Pass or the California Resident Pass, please visit UniversalStudiosHollywood.com/tickets. 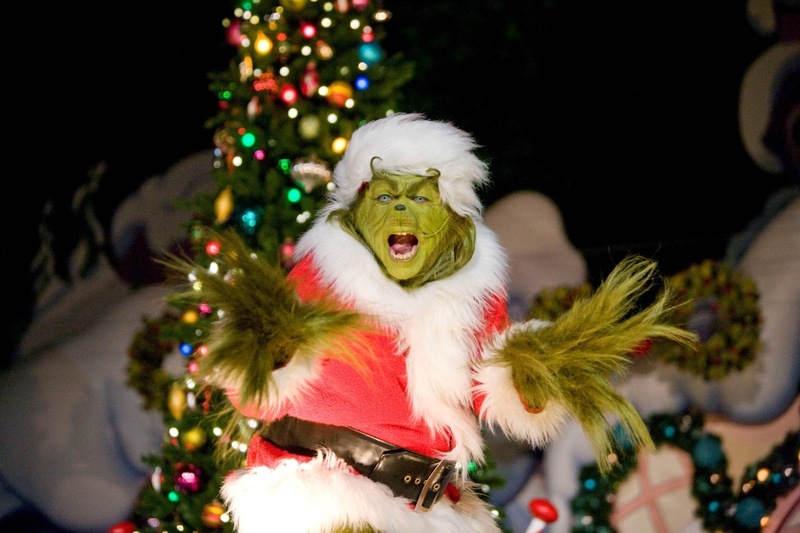 “Grinchmas” is included in the price of theme park admission. The spirit of the season continues with a wintertime transformation of Universal CityWalk, beginning the day after Thanksgiving on Nov. 27 through Jan. 1. A spectacular 40-foot tall Christmas tree will glisten with 200,000 LED icicles choreographed to the lights and sounds of the season in the “5 Towers” plaza. Santa Claus will make nightly appearances and offer special photo opportunities at “5 Towers,” plaza complete with evening hourly snow falls at the heart of CityWalk. Visits from St. Nick, along with free concert performances and an eclectic ensemble of talented street performers will make CityWalk the ultimate L.A. holiday destination. About Dr. Seuss – Theodor “Seuss” Geisel is quite simply the most beloved children’s book author of all time. Winner of the Pulitzer Prize in 1984, an Academy Award, three Emmy Awards, three Grammy Awards, and three Caldecott Honors, Geisel wrote and illustrated 45 books for children. Hundreds of millions of copies have found their way into homes and hearts around the world. While Theodor Geisel died on Sept. 24, 1991, Dr. Seuss lives on, inspiring generations of children of all ages to explore the joys of reading.